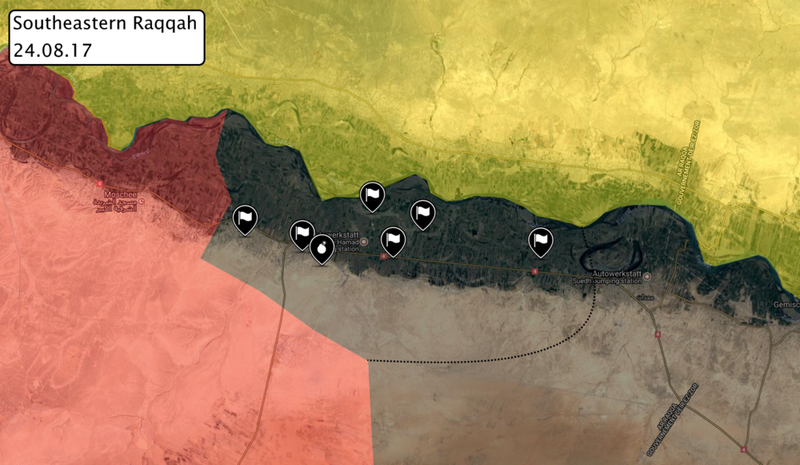 On August 24th, The Islamic State of Iraq and Syria (ISIS) launched an offensive on the Syrian Arab Army (SAA) positions south the Euphrates river in the Easter Raqqa countryside, managing to retake control of Al-'Athsanah, Al-Muqlah, Salim Al-Hamad, Al-Buhamad and Al-Huwiyajiah as well as the two major towns of Ghanim Ali and Zawr Shammar. ISIS took advantage of the redeployment of the elite SAA unit, the "Tiger Forces" that focused on linking Al Kawm with Al Sukhna in Homs about 80km southeast of Ghanim Ali, thus leaving the less equipped and trained local tribal forces loyal to the Syrian government to defend against this attack. The official ISIS news outlet Amaq reported these gains, while also claiming to have killed dozens of Syrian army forces after detonating atleast one SVBIED (Suicide-Vehicle-Borne-Improvised-Explosive-Device). While the casualty and destruction count by Amaq agency reports is exaggerated, the capture of the village is almost certain to have happened if it was reported. Despite this small victory in Raqqa, ISIS is increasingly losing ground to government forces in the neighboring Homs province as the later has recently besieged the Islamic State in 2 separate pockets in central Syria, and has made considerable gains towards the border of the Deir ez-Zor governorate in Homs. It is likely that the "Tiger Forces", including their infamous commander, Suheil al-Hassan (The Tiger) will redeploy once again to Raqqa as these villages, along with the last ISIS stronghold in Raqqa, Maadan, are key to breaking the four year old siege on the provincial capital of Deir ez-Zor. The threat of further ISIS counterattacks will only be diminished after the town of Maadan is captured.